Argyle (or Argyl) truly never goes out of style. 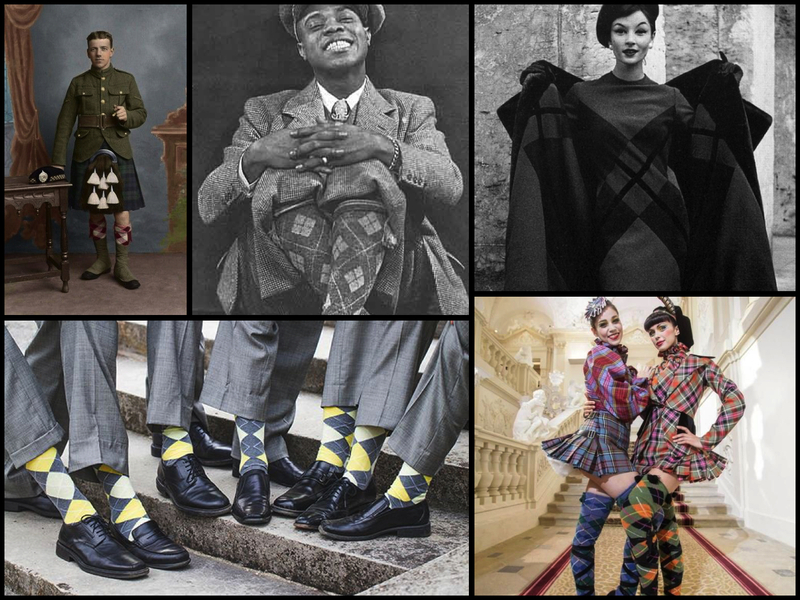 From the World War I Highlanders and Louis Armstrong, through Pierre Balman in the 50s to Vivienne Westwood’s current creations it’s amazing to see how it’s been interpreted over the years and the ways it’s been worn. How awesome are those socks in that wedding party photo by Abbey Caldwell? We have the Clan Cambell of Argyll Scotland as they used the basic pattern in their kilts and plaids. Scottish Highlanders have been wearing these patterned socks since at least the 1600s (they were generally known as “tartan hose”). After World War I, argyle knitwear became fashionable in Great Britain and then the United States. This entry was posted in Argyle, Design, Designer, Fashion, Fun, Men's Fashion, pattern, print & pattern, Surface design, Textiles, Trend Blogs, Trending, Uncategorized, Vintage, Women's Fashion and tagged Abbey Caldwell, Argyle, Design, Design Works International, Designer, Designer Fashion, Fashion, Fun, HGTV, HGTVHome, Louis Armstrong, Men's Fashion, Nancy Fire, National Argyle Day, Pierre Balman, Surface design, Textiles, Trend Blogs, Trend prediction, Trending, Trends, Vivienne Westwood, Women's Fashion by Design Works International. Bookmark the permalink.